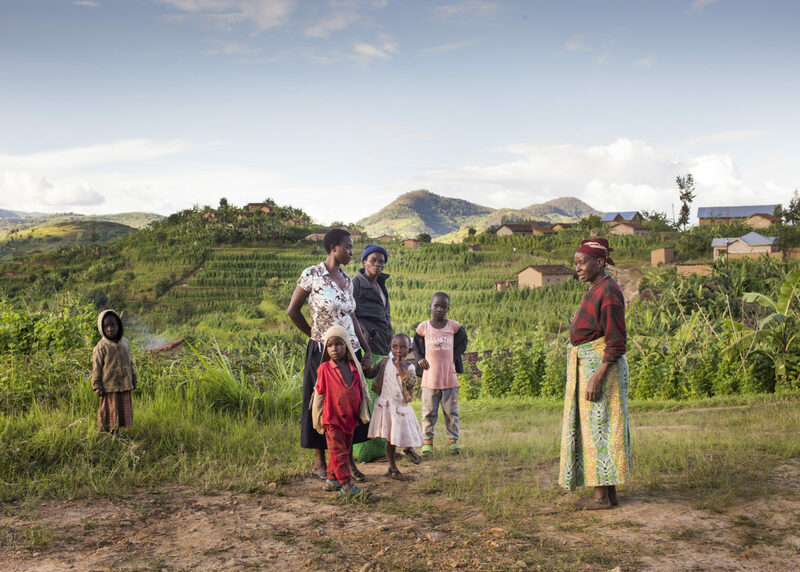 (EN) Jenoresse Uwumuhoza, former prostitute, 27 years old, with mother Baratsarinse Dafnose (70), daughter Laissa (4) and other children, 2015 Kigarama Village, Ngororero, Rwanda. (EN) Rwanda has more women in parliament than any other country in the world. Since its last election in 2013, sixty four percent of seats in the lower house were designated for female politicians. (EN) Rwandan women have created an unparalleled political space for themselves in the last 24 years since the genocide killed nearly one million people, equaling a seventh of its then population. Kigali, the capital, has evolved into a bustling hub for progressive start-ups, entrepreneurs, and art spaces—often with women founders and leaders. In 2016, photographer Espen Eichöfer went to meet seven of them, ranging from a fashion designer to a social worker to discover how they perceive gender equality in the country they call home. Eichhöfer describes Rwanda as a small country with good living conditions, although much of its rural population depends on subsistence farming. While its capital circles around an accessible center with no typical slum areas, the countryside reminded the photographer of Switzerland with a similar Alpine feel to it. Eichhöfer’s first impression was surprising: “I have never seen such an Africa before,” says Eichhöfer. “The country received a lot of UN funding after the genocide. Luckily that money was used for infrastructure and education and Kigali now feels very European; the architecture and entire sentiment is very different to other African cities,” he explains. Eichhöfer’s encounters were very diverse, especially as his protagonists varied between unofficial and official roles. “In Africa, it can be hard to approach people, especially when they are decision makers. They always wonder what journalists want from them, so you have to be very prepared,” he says. Capturing people in social contexts is no unfamiliar task for Eichhöfer. After receiving his first camera at the of 13 and creating his first black-and-white lab under his parents’ roof, he documented struggling neighborhoods in Duisburg. Since his studies at the renowned Folkwang University of the Arts in Essen, his curiosity for human kind has taken him around the world. The topic of emancipation has not only brought him to Rwanda. In 2015, he portrayed Norwegian men—who count to be the most emancipated worldwide. (EN) Teta Diana, 23, a singer in the street in Nyarugene District 2015, Kigali, Rwanda. (EN) Parliament, boardroom with parliamentarians, 2015 Kigali, Rwanda. (EN) Agnes Binagwaho, Minister of Health, in the Ministry of Health, 2015, Kigali, Rwanda. (EN) Photographer Espen Eichhöfer’s work focuses on social and documentary reportage. Among current affairs, he has covered topics from travel to gender. Eichhöfer is a member of Ostkreuz, a Berlin-based photography agency of which we have also featured photographer Jörg Brüggemann. Selected reports are also available on the homepage of Ostkreuz.